If your hot water storage tank feels warm to the touch, the water in the tank is losing heat, which means the water heater's heating element periodically needs to turn on to reheat the water even when you aren't using hot water. Adding an extra layer of insulation can help to reduce these standby losses by 25 to 45%, and water heating costs by 4 to 9%, depending on the R-value of the existing tank. 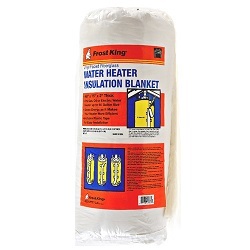 This water heater blanket is made of fiberglass insulation, and is designed for use with water heaters with capacities up to 60 gallons. This blanket has an R-value of 10.0. Examine your existing hot water tank to see if there any posted restrictions about adding an exterior tank wrap. Always follow tank manufacturer's guidelines regarding external tank wraps, be sure to leave access panels and/or vents uncovered, and reduce the temperature setting to 130 degrees once the additional insulation is installed.